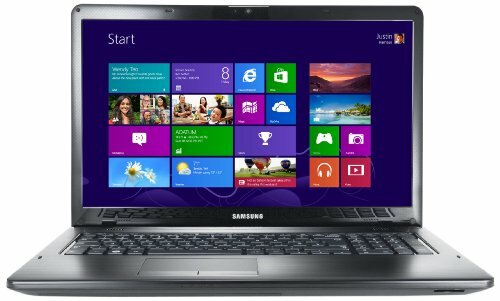 Below is our review of the Samsung 350E7C, a 17.3" laptop, featuring 6GB RAM, 750GB hard drive and Windows 8. The 350E7C is Samsung's latest offering in the competitive mid priced 17.3" laptop market. Currently available for just over £400, it sports an impressive 17.3" clear screen, together with an Intel Pentium B970 processor and 6GB of RAM. The first thing you notice about the 350E7C is beautiful brushed black finish - this should disguise and hide any finger prints, thus helping the laptop to retain it's new looks. In order to accommodate the 17.3 inch display, the overall dimensions of this notebook are a touch larger than a standard 15.6" laptop - in total it measures 41.1cm by 27cm by 3.5cm, and weighs around 2.8kg - this may make this laptop a touch too large for regular commuting and travelling. The 17.3" anti reflective screen runs at a default resolution of 1600 x 900, at which it appeared crisp and displayed colours accurately - overall we were impressed with the clarity of the display. Running on the Microsoft Windows 8 platform, this laptop is powered by an Intel Pentium B970 2.30 GHz and a generous 6GB of RAM, which helps to keep applications running at speed. In terms of storage you are supplied with a 750GB hard drive as standard, which should be enough space for most users - although with multiple USB ports, as well as a card reader it is possible to easily upgrade this via external components. The notebook provides HDMI output, as well as VGA, 2 x USB 2.0, 2 x USB 3.0, a multi-card reader, headphones and microphone jacks, as well as Ethernet and DVD - which should provide enough input and output options for all but the most demanding of users. The keyboard is nicely sized, running the full width of the notebook, with the added handy feature of having a full sized numerical keypad situated to the right hand side of the letter keys, thus making numerical input easier for accountants and the like. The gaps between the keys make typing easier - typing errors were less frequent than when typing a normal PC keyboard - all of our testers found it comfortable typing and sitting in front of the display. So overall what did we think of the 350E7C? Pros: Decent 17.3" screen, with a fairly good specification. Cons: Quite bulky and heavy, although this will be the case for most 17.3" laptops. The Samsung 350E7C offers pretty good value - if you need a large screen laptop then you could do a lot worse than taking a closer look at the Samsung 350E7C.